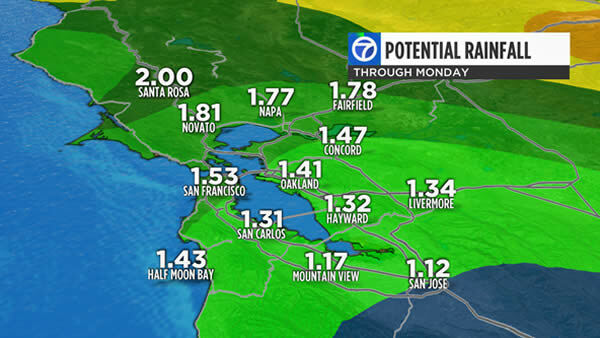 SAN FRANCISCO (KGO) -- A month's worth of rain in the Bay Area over the next three days? It's looking very possible, but how? PWATs or Precipitable Water has the answer. PWATs shows us how much rain a storm could unleash if we squeezed out every single last drop. Live Doppler 7 will show our first storm Friday morning has PWATs exceeding 1.8 inches. That's almost three times the normal for this time of the year. Our storm Friday and another one over the weekend will both rank a two on the Storm Impact Scale. The storms are getting some help from what was Typhoon Songda. The leftovers of Songda are helping "juice up" our systems. When we combine the two storms and look at potential rainfall through Monday, many spots will likely end up with more than an inch of rain. 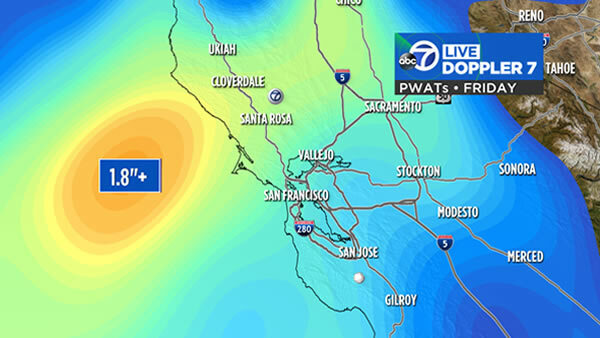 Spots in the North Bay will likely see more than 2 inches. 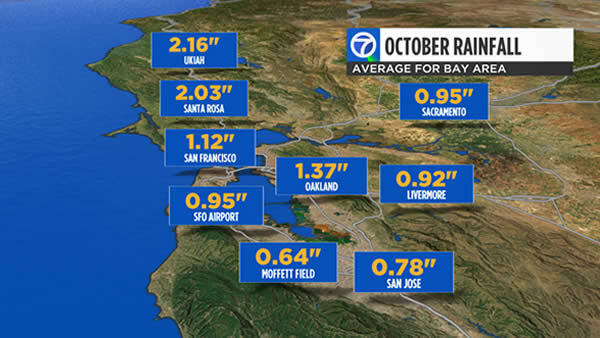 Looking at average rainfall for the month, you can see many cities have the potential to quench their October thirst in the next three days. What's the weather like #whereyoulive? Share your photos and videos on Twitter, Instagram, or Facebook by tagging them #abc7now. Your photos may be shown online or on TV!